A guest post from my husband, Chuck Raasch, affectionately known in this blog as CRR. He recently traveled cross-country with our son. Political handicappers in the nation’s capital expressed surprise last month when former Montana Gov. Brian Schweitzer, seen as the Democrats’ best hope to hold on to the seat of retiring Sen. Max Baucus — and with it, possibly keep control of the Senate — decided not to run next year. For much of July, I decided to step out from the ranks of buyout refugees from American journalism to become another kind of vagabond. John Steinbeck, in a mood similar to mine (and Brian Schweitzer’s), once drove the roads of this country with his dog Charlie. I had an even better companion: my 24-year-old son, Sam. Together, we drove and hiked, taking our sweet time from Seattle to D.C.
After compiling bylines from 49 states in my career, I’m convinced that you cannot even begin to understand what you don’t know about this country until you have driven across it, probed its byways, sat in its cafes, and listened to its local radio. This was my third cross-country trip, fourth if you count the one from the Lower 48 to Alaska via the Alcan Highway. This time, I came away with a much different feeling than on any previous trip. There’s a growing indifference toward Washington in Flyover Country. Not in any naïve sense that it has lost power over people’s lives, but more of a feeling that anger, hope, insurgency, and change have not really changed how the town works. So why bother? It’s no wonder Mr. Schweitzer is not coming to Washington. Most Americans I talked to along the way were still in love with the ideal of America, and you can understand why. It is a great country, despite our problems and self-doubts. We reveled in both the grandeur and garishness of Flyover Country. We hiked to the summit of the 10,243-foot Mount Washburn in Yellowstone National Park; from there you can see 50 miles in any direction. In the stunning proportions of Glacier National Park, we trekked above the tree line to a pristine alpine meadow whose beauty forced an appreciation of Teddy Roosevelt’s activist Republicanism. After paying $20 to see a mountain in the Black Hills of South Dakota being carved into the purported image of Crazy Horse, we pondered the objections the great Sioux leader was raising, in spirit. 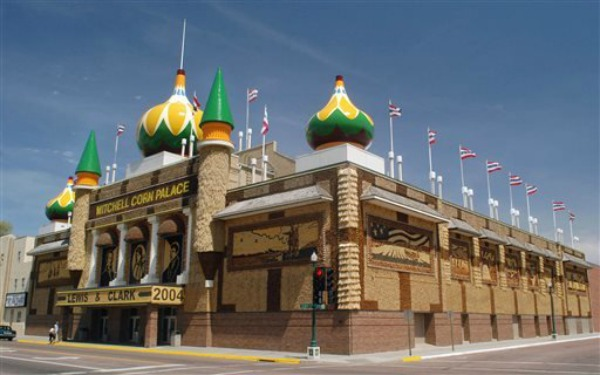 We paid homage to the agrarian Oz — the Corn Palace in Mitchell, S.D. We drove the Herbert Hoover Highway in Iowa, where locals are not nearly as down on the Depression president as are historians. We took a two-day journey across a green sea of corn and soybeans that stretched from Minnesota to Ohio. West Virginia’s mountains at dusk are just as beautiful and majestic as anything Out West. I called it our “Those Towns” journey, what seemed like a logical response to the snarky tweets I was seeing about “This Town,” Mark Leibovich’s gossipy takedown of Washington. No index — take that, D.C. social climbers! People are getting rich by trading on their influence, acting cravenly, or sucking up! The new guys who promised change haven’t changed much at all! Names were named! The naming of names was big inside the Beltway, but in Those Towns, “This Town” seemed yawningly familiar. A tale of inside trading written for the insiders. I’ve spent a lot of time in Those Towns, and observed some of the great movements of the last 40 years through them. I had a grassroots view of the rise of the religious right in the late 1970s while covering George McGovern’s last Senate race in ’80. I watched people running in the parking lot of a California mall to sign a Perot-for-president petition in ’92, and saw others crying at Obama events in rural Iowa in ’08. Anyone who was paying any attention to Flyover Country in the early 2000s knew that Tea Party antipathy to business-as-usual had been brewing long before it was given a name. Yet so many of the big stories in Flyover Country are happening irrespective of what D.C. does. Detroit went bust, despite a thriving auto industry that not long ago needed a federal boost. North Dakota’s energy boom is spilling into neighboring states despite the lack of a coherent national energy policy that merges the economy and the environment, and people there think the boom is going to last. Despite lingering pockets of drought and Congress’ struggle to come up with a new farm bill, the Farm Belt is about to deliver a potentially record corn and soybean crop this fall. On farm radio stations, Brazilian soybean yields or Japan’s latest wheat purchase are as important as anything out of Washington. During a brief stop in Hungry Horse, Mont., I emailed a former boss back in D.C., saying that the capital seemed a lot further away than the 2,300 miles that separated us. Literally, it feels so. Social media’s “me-ism” ethic is deleterious to the tenets of a journalism that seeks the unfamiliar and explains the unknowns of a larger world. The economic pressures it has brought to traditional media and the celebrity-as-news movement have made it harder to do the explanatory and oversight journalism that once brought Washington and the provinces closer. Local and regional newspapers and TV stations have shuttered or stripped down their Washington bureaus. Coastal-centric national cable networks and news organizations have devalued original, explanatory and expensive reporting on Flyover Country in favor of drive-by disaster coverage or the same endless-loop ideological arguments from people who, you suspect, not only have never been to places they are talking about, but have absolutely no desire to go to Those Towns. As a consummate newsie, I am always attuned to local coverage when I travel. I have learned more from any random local weekly than any episode of “Crossfire.” And over two weeks and nearly 3,000 meandering miles, I can’t remember picking up a paper or listening to a radio news program that ran an interesting, local-impact story about doings in Washington. Except, of course, the one about Schweitzer’s desire to keep his dog far, far away from This Town. Chuck Raasch is a former national reporter for USA Today.